We also see the American voters flirting with the idea of Donald Trump as President of the United States, and several analysts have drawn the common linkages between the Brexit vote and Trump support. For example, both voter types are linked to authoritarianism and a growing sense that a better future may simply not be available for most. Ironically, it may well be that the amount of danger and risk is not really rising. What is rising is the vivid impressions drawn from ubiquitous digital video technology which fuels a torrent of heart stopping imagery on both social media and conventional media. Couple this with a continued sense of despair about the end of the era of shared prosperity and middle class growth and we have an unpredictable stew of social and economic forces which may well be contributing to the very stagnation that is producing this collective angst. Yet within these largely negative forces we see some surprising resilience and hope in our citizenry. This is linked in part to the continued favour that the federal government receives and to a clear pattern of growing support for restoring a more active federal government and stronger public institutions. But this overall trend is very much rejected by a sizable minority who are unhappy with the new bolder direction of the federal government. There are a myriad of factors influencing the new zeitgeist: aging populations, increased pluralism, the impacts of the digital transformation, geopolitical tensions, and terror and security concerns. None of these factors are as important as the rising sense that economic progress and shared prosperity have stopped working in the way they did in the last century. This is captured in shifting class formation with a shrinking middle class and a predominant sense that the future isn’t going to be what it used to be. Closing of the Canadian mind. In this analysis, we will consider some critical tracking data which sheds light on the trajectory of these forces. The tracking also shows the tensions across a more optimistic and open world view and a more closed view linked to a more pessimistic outlook. 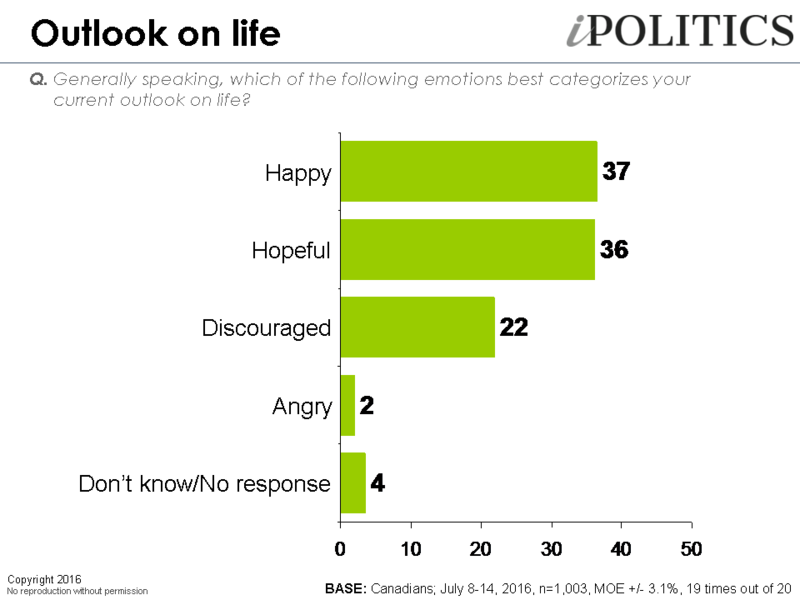 When we asked Canadians to summarize their overall outlook across four options (angry, discouraged, happy, or hopeful) there is a clear lean to a more positive outlook. Against the backdrop of unremitting gloom and danger permeating social and traditional media, it is rather remarkable to note the clear preponderance of happiness and hope over the negative emotions of discouragement or anger. Indeed, positive emotional outlook supersedes negative by a margin of three to one. The happiest people in Canada are the university educated and Liberal supporters (who, as we discussed earlier this week, are often one in the same). It is interesting to note that in addition to the clear lean to a positive emotional outlook, the incidence of those who feel they have lost ‘all control’ over their economic futures, although still significant, is actually lower than what we saw in the late 1990s. A sense of lost control is linked to a more negative emotional outlook and is strongly linked to the more economically vulnerable in society. 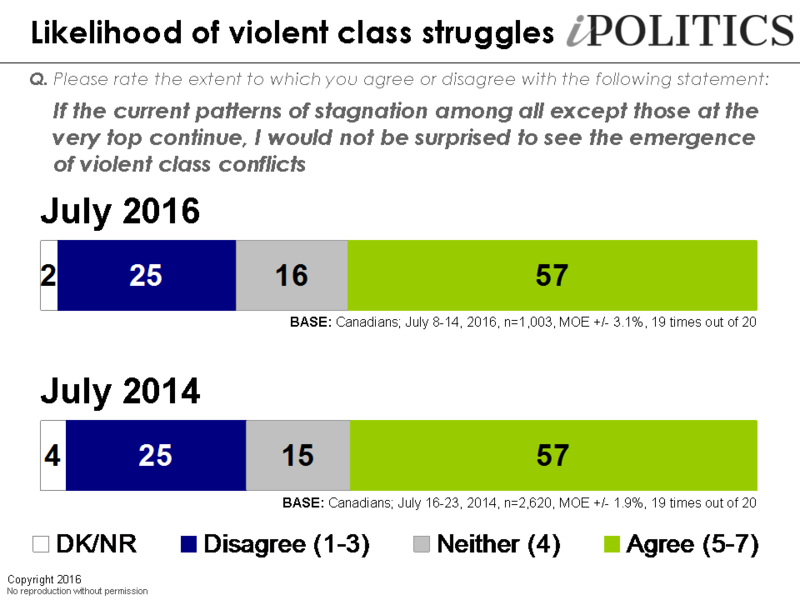 As we witness growing tensions across social class and race we thought it might be interesting to update a question asking whether if present trends of inequality continued we would be seeing ‘violent class conflicts’. By a margin of over two to one Canadians are more likely to agree with this rather stark prediction. Having flirted with the End of History thesis in the late stages of the twentieth century, we are now more likely to see Marx as having the more prescient assessment. This sense of imminent violent class conflict is more pronounced amongst the progressive and better educated cohorts. For those who have been denying the depth of resentment percolating in advanced western societies these numbers suggest that this is real. As George Santayana noted, those who cannot remember the past are condemned to repeat it. Our hypothesis that a broken incentive system and rising inequality are connected to middle class decline is partly supported by this frankly shocking finding. Another one of our core hypotheses is that shifts in the role of the state, public institutions and taxation have driven stagnation and middle class decline. 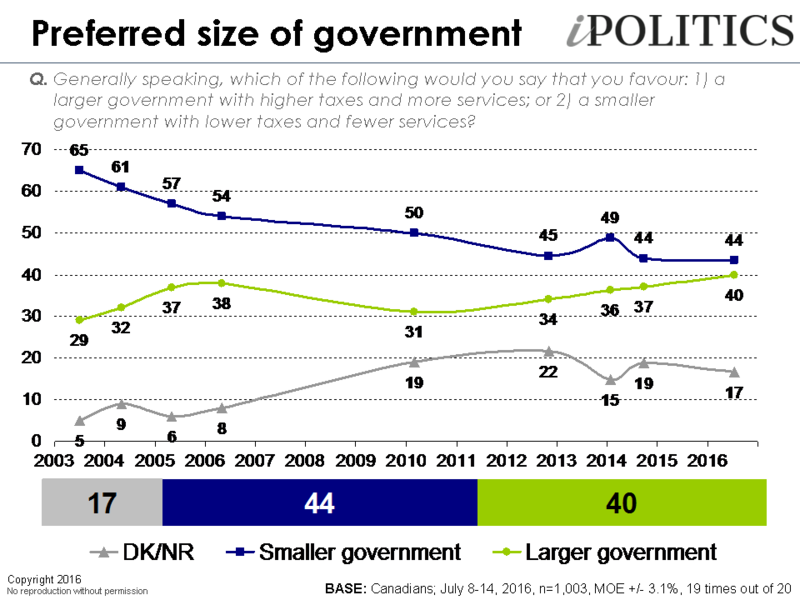 One particularly revealing indicator is the question which asks if people want a smaller government and lower taxes or a larger government and more services. From the beginning of this century to today we see a remarkably clear pattern which suggests a sea change on this critical question. In 2003, the clear preference was to smaller government (over two to one advantage). As the century has unfolded there is a near monotonic decline in support for lower taxes and smaller government and a corresponding rise in support for larger government. The important point is that as the economy has stagnated, and shared prosperity withered, the public are increasing disdainful of the neo-liberal model which came into place in the eighties and beyond. The bumper sticker simplicity of the less government and lower taxes equals prosperity for all has been laid bare as a cruel hoax. Note the question includes the politically verboten idea of ‘more taxes’. Will Davis argued that despair about a bleak future was a critical driver of both leave support in the United Kingdom and Trump in the United States. Separately, we have argued that stagnation and security fears has produced a closing of the Canadian mind when it comes to the three pillars of globalization: immigration, free trade, and foreign direct investment. Ironically, the very public responses to stagnation may be diminishing the public appetite for some of the solutions to restoring middle class progress. We will review response to Brexit and show that these forces are revealing a potential end to the more optimistic view of globalization which was a point of consensus when the century opened. One of our core hypotheses for explaining the protracted period of arrested economic development was that the security ethic which gripped upper North America in the aftermath of September 11th has had an extremely deleterious impact on our economy and the basic sentiments and values which underpin liberal capitalism. It is instructive to compare the second decade of NAFTA with the first decade. The straight line growth in GDP that occurred in all three member partners of NAFTA in the first decade looks nothing like the meagre growth in the last decade. The sclerotic sludge introduced in the vain search for an elusive, terror-free society has been far more damaging than the actual terror episodes. The politics of fear has also shifted the debate about immigration, security, and openness to globalization. If this is even partly true it is disturbing to see how the pubic are seeing the balance of danger and safety in the world. 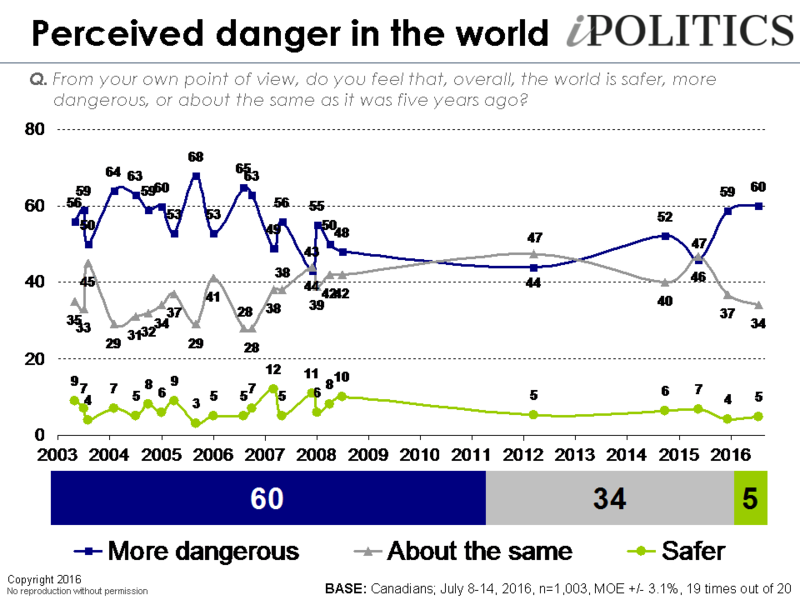 Less than five per cent think the world has become safer over the past decade and 60 per cent believe it has become more dangerous. A rational review of the evidence would suggest that objective risks and safety of North Americans have improved over the last decade. But the emotional response to risk perception is egregiously different. Not only is this having a damaging effect on the spirit of capitalism and civil liberty, it has also changed political discourse to a much baser and demagogic narrative. This magnified sense of danger is linked to a more ‘ordered’ or authoritarian world view and this outlook is strongly connected to politics in the case of Brexit and Trump and there certainly were strains of this evident in Canada in the last federal election. 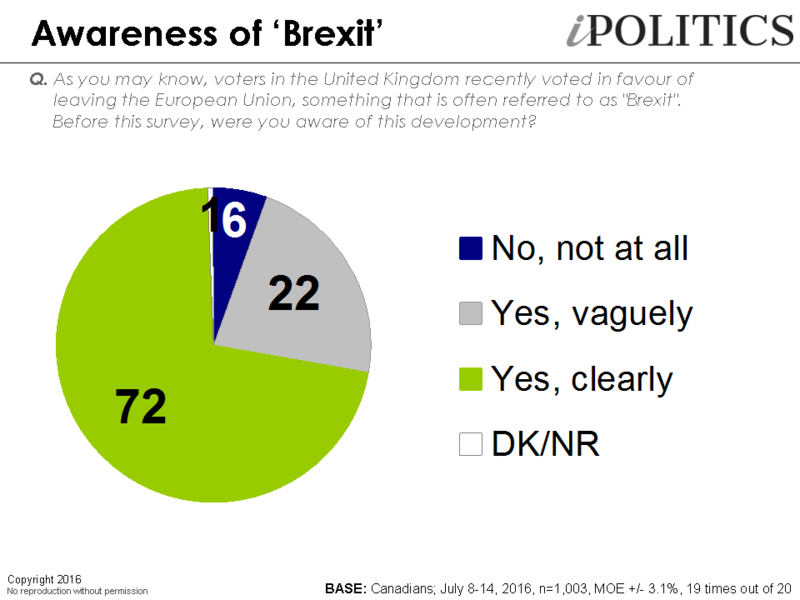 Brexit was watched with great attention by most Canadians and the overall sense is largely that it would be historically significant in a largely negative manner. 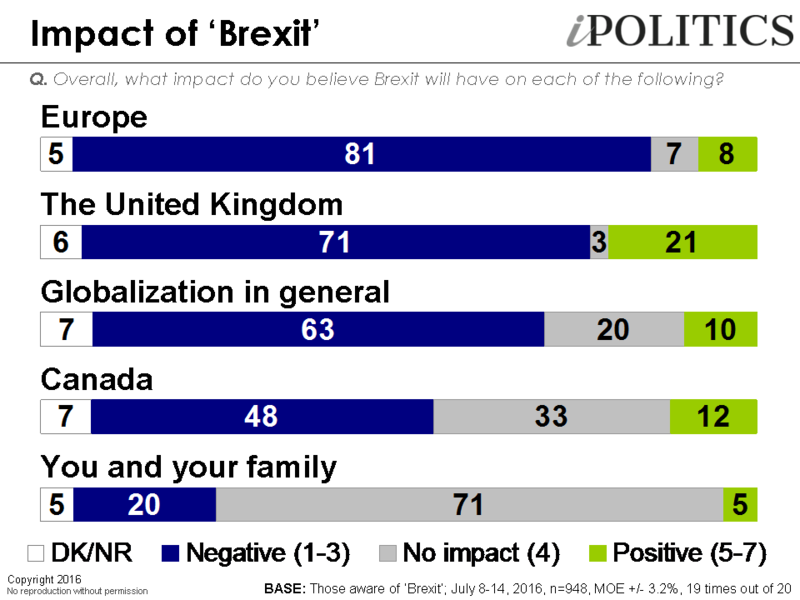 Most see very negative effects on the UK, even worse on Europe and more modestly negative effects on Canada. There is a sense that Brexit is part of a series of signals about the possible death of globalization. It is interesting to note that one of the drivers of a more closed outlook is precisely this sense that individuals have surrendered control over their economic futures. As Davis notes in his sociology of Brexit, this is strongly connected to the final outcome and he notes the genius of the leave side’s ‘take back control’ slogan. This is also at play in the United States and Trump’s appeal to making American ‘great’ again. This is an appeal to restore order and control to lives where this has conspicuously evaporated. In this poll, we created a simple ordered versus open scale based loosely on some of this other work. We find that Canadians are considerably more open than closed on most tests such as the basic concepts of order and openness, the preference for reason over morality, much more in favour of questioning authority than ‘obedience’. Other test such as respect for authority versus freedom produce more divided responses and on the good behaviour versus creativity choice we are actually more likely to prefer duty to creativity. There are clear and dramatic fault lines underpinning these choices and this difference in orientation is highly predictive of political choices. When we summarize the results we find that overall a clear majority of Canadians lean to openness (54 per cent) versus the not insignificant minority who favour order (33 per cent). These numbers, while rough, suggest that an authoritarian or ordered outlook is less common in Canada than the United States (according to PEW who found over half of Americans to be authoritarian). It is probably the case that this number is raising in Canada. The critical fault lines in this orientation are first of all partisanship which a good proxy for ideology. There are huge differences with Conservatives being dominantly ‘ordered’ and everyone else open. The most open are supporters of the smaller parties (i.e., the NDP, Bloc, and Green Party). While men and women are no different on this scale, openness seems to decline with age (highly significant, but a weaker effect than party preference). Finally, we see linkages to education which is a good proxy for social class and vulnerability. Just as the university educated are happiest citizens they are the most open by far. To reduce this to the simplest terms we now see glaring fault lines across a broadly open and optimistic world view and a more closed and ordered world view. These are connected to economic stagnation, aging, and political ideology. The significance of the Brexit result was the triumph of the forces for order and recapturing ‘control’. We shall see how these forces unfold it what has been a highly unpredictable U.S. presidential race. This orientation is strongly linked to core choices about active versus minimal government and the clash of fear and hope. At this time, the forces for openness are in clear favour in Canada, but this struggle will be the defining feature of our political discourse in the coming years. While panellists are randomly recruited, this survey was conducted online only, meaning that it excludes the roughly one in six Canadians who either can not or will not respond to surveys online. Results should therefore be considered representative of Canada’s online population. The field dates for this survey are July 8-14, 2016. In total, a random sample of 1,003 Canadian adults aged 18 and over responded to the survey. The margin of error associated with the total sample is +/- 3.1 percentage points, 19 times out of 20.